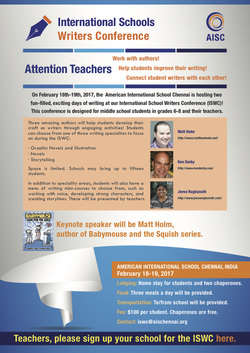 On February 18th and 19th, 2017, I will be speak and make presentations at the International Schools Writers Conference in Chennai, India (at the American School of Chennai). I look forward to helping middle school students (from around the world) develop their craft as writers! Following the International Schools Writers Conference, I will participate in an author visit at the Overseas School of Colombo, Sri Lanka from February 22-24. From April 17-21, 2017, I will return to India and will take part in an author visit at the American School of Bombay. I look forward to visiting the India subcontinent in 2017!